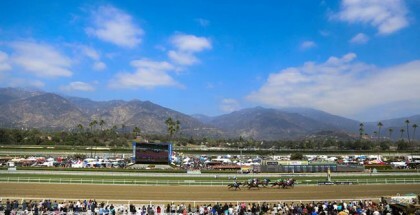 The 2013 Sunland Derby takes place in Sunland Park, New Mexico tomorrow March 24. Sunland Park Racetrack & Casino will host a field of nine Kentucky Derby hopefuls. 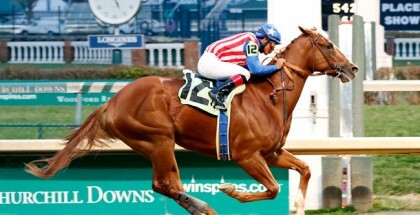 The winner will be awarded $800,000 and 50 points towards their entry into the 2013 Kentucky Derby. The 1 1/8 mile dirt track features Todd Pletcher’s Abraham with 4/1 odds breaking from post position number two. Trainer Bob Baffert sends out Shakin It Up, with 5/2 odds, and Govenor Charlie, with 6/1 odds, into the Sunland Park Derby. Trainer Bob Baffert sends out Shakin It Up, with 5/2 odds, and Govenor Charlie, with 6/1 odds, into the Sunland Park Derby. Both three-year-olds placed first in their last races. Shakin It Up and Govenor Charlie are strong leaders in this race. I don’t usually pick Bob Baffert trained horses but feel both of them will place in the top four. Hopefully Bob Baffert takes Lady and The Track’s advice and gets wasted tonight (day before raceday) on a few whiskeys. The looser Bob Baffert appears the luckier he seems to be. 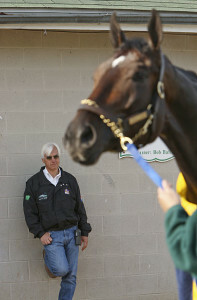 Some people just perform better when they are relaxed and I think Bob Baffert is one of them. Dry Summer is a local fan favorite. He recently won the Mine That Bird Derby, which is a prep race for the 2013 Sunland Park Derby. Dry Summer breaks from post position number six with 5/1 odds. Dry Summer is a “ridgling” horse, which means he has one undescended testicle. I’ll pick Dry Summer because he is the local hero. Post time for the 2013 Sunland Derby is 5:40 PM MT and is the eleventh race of the day. Lady and The Track would like to wish all of the contenders in the 2013 Sunland Park Derby the best of luck! Good Luck! Safe Run!